Katlix Design | Dutch design by Katlix standards. Dutch design by Katlix standards. I am in such a good mood lately because of the lovely summer weather. I only want to wear dresses right now. The bohemian dress from Bluseagal is perfect for warm weather like this! And it’s so pretty, I absolutely love it. The necklace from OuiClementine is so delicate and gorgeous! 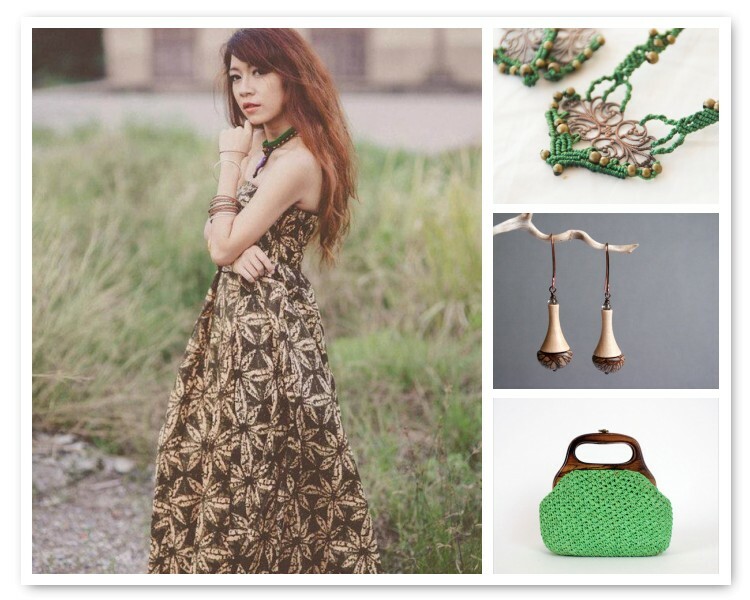 I just love how well the green and bronze work together. I have been a fan of rokdarbi and the seller’s other shop gofenshefer for a long time. The jewelry is so well made and eco friendly to boot. And her product photography is great to look at. To finish the outfit I chose this cute little bag from OmniaVTG. I have a thing for bags that are made with wood handles. It looks perfect for warm weather. Okay, now I’m sad because I don’t have any of these items! 😛 Look for more outfit inspiration on Star of the East blog! A few weeks ago I participated in an online photography event called “synchronized watching” organized by Else Kramer. Around 1250 people participated, me included. The premise was simple: sign up and for a whole week you get a new assignment or theme every day. Then you post the pictures you’ve made on various social media and tag them appropriately. The first one was pretty straightforward, to ease us in. I chose to use my macro lens (a very cheap add-on to your existing lens, but it does the trick!) and get a nice close-up. I tried out various arrangements till I was satisfied with this one. This theme was tricky all on its own, because the day (actually the whole week) we got this assignment it was lousy weather all around. So how are you supposed to use that in your expression of what summer means to you? I did it by picturing something that is my go-to summer refreshment: homemade iced tea. It’s a simple concept and I added frozen raspberries for extra freshness and summer feel. A very broad theme once more. 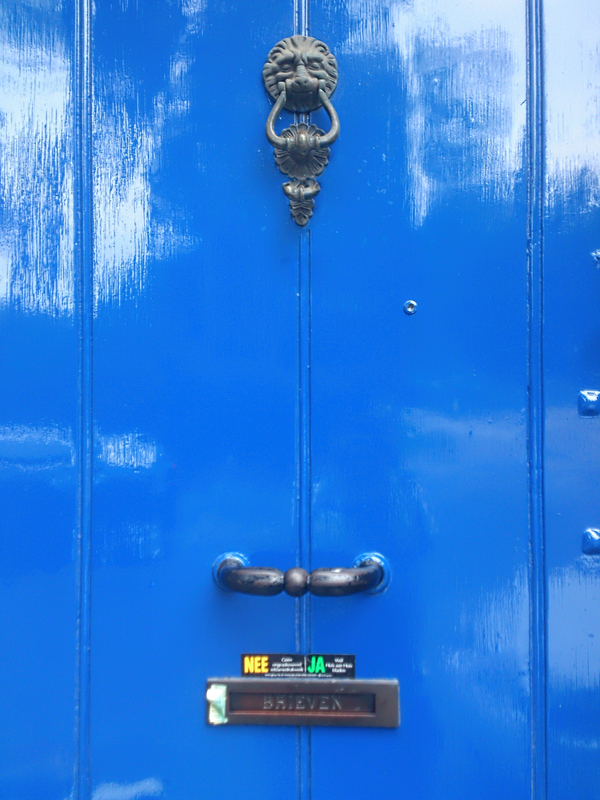 I didn’t want to make a staged photograph so I biked around the city until I found this door with the gorgeous knocker and snapped it up with my phone. It’s simple, but I like it. Now were talking! A very deep theme indeed. Some participants really laid their life bare with this one. It’s very interesting to think about picturing something that’s not there. The only way to do that is to make it visible in some way. So I bought a bubble blower and started experimenting. Not as easy as you think when you’re on your own! You can’t hold the camera to your eye and blow the bubbles at the same time. You don’t really have the time to alternate the two (especially if it’s windy, which it was). So after over 200 pictures I was lucky to have snapped a few that had both and interesting composition and were sharp. Ah, I got to combine two of the previous results in this picture! I set out with my macro lens, but didn’t really find anything interesting. I had the idea to maybe take a picture of a bubble’s reflection or something, but it didn’t really work out nicely. There aren’t really much interesting flowers or plants around here so that plan was out as well. 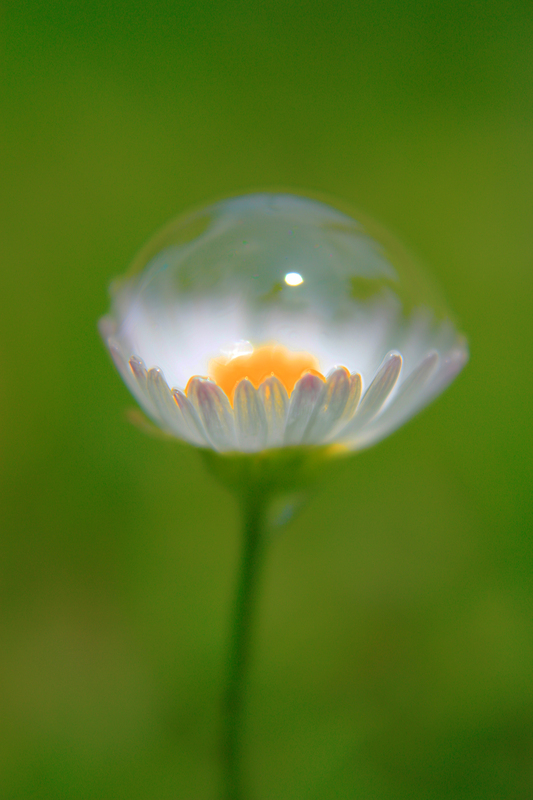 Then I had the idea of sticking a bubble to a flower. Now this was even harder than my attempts of the previous day! My boyfriend was with me to assist me and it took a few tries but we eventually managed to do so. Now this was the scary one! Would you just show yourself to over a thousand other people you’ve never met? Of course you were allowed to only show a small part of yourself, like feet or hands. And there were some who took selfies, used mirrors or photographed shadows. 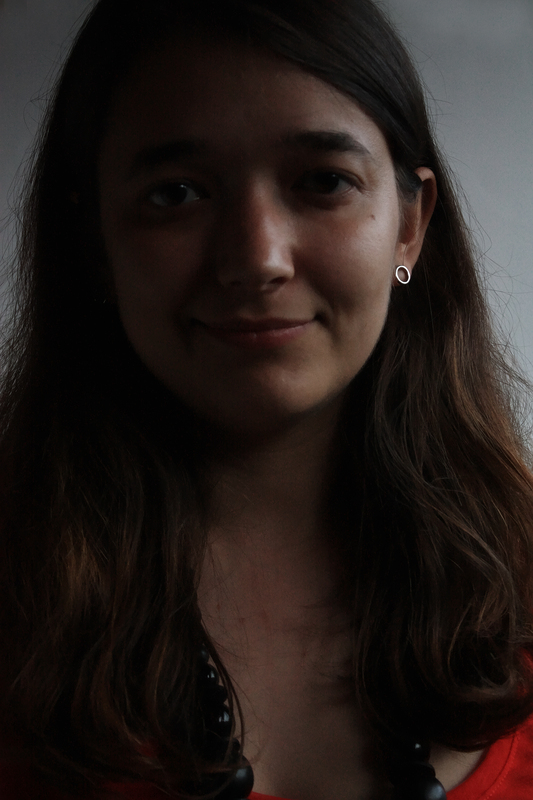 But I went for the all-traditional and quite simple head shot. It turned out dark since I was home late that day and light was scarce, but I kind of like that. I use it as a profile picture now. As for the verdict: it was a fun and very interesting week! It really forces you to get out your comfort zone to photograph things you normally wouldn’t (or didn’t have time for in the past). Moreover, it motivates you to keep up so you can share your pictures with the other participants! And that was truly the most fun part: to just browse through all the pictures and like or favourite them and strike up a conversation with another photographer. I will definitely try and participate again next year. This “summer” has been absolutely crazy so far. We’ve only had a few warm and sunny days and they were gone way too fast. It really depresses me because I was simply born for warm weather and sunshine. I simply function better when it is warm. During those few sunny days I was very contently working outside under a tree for at least some partial shade so I don’t get a sunburn. Always use sunscreen, kids! Also when you use sunscreen your tan will hold on much longer. For this week’s outfit I chose for some bright items with a dark background. It was only naturaly that I went with an outfit from Pierogi Picnic. This shop makes excellent fashion by upcycling old clothing and the result is fantastic. Their style is bright and a bit funky and always seems to have loads of personality. If that wasn’t it, they also make use of excellent backgrounds that make you smile when browsing through their shop. Natalka has the most amazing jewelry in her shop, based on traditional Ukrainian embroidery patterns. Lately she has also been experimenting with even finer and tinier embroidery and the result is gorgeous. Her shop not only has character because everything is handmade and designed by one person, but also because it displays the rich cultural history of craftsmanship of the Ukraine. I know, it’s not exactly an item you can wear, but I couldn’t resist including the hot air balloon from Ariënne’s shop. It just went so perfectly with the rest of the items. Plus it’s just so incredibly cute! There is just so much detail that goes in every single piece and you can even design one with your own colour combination. 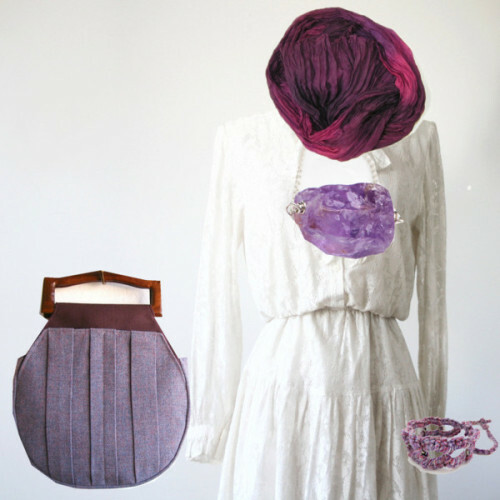 The outfit is finished with this beautiful purse from Simply Boheme. I’m very drawn to this purse as it has that cute ethnic look that I adore and I also love it when two (or more) completely different materials are used together in a complimentary way. Leather is tough and rugged, but it still goes fantastically together with the warmness and softness of patterned fabric. And it compliments the bracelet I also chose for this outfit without making the outfit too busy. I hope you check out these fabulous shops! For more friday night outfits you can visit Star of the East blog! What is Christmas in July? 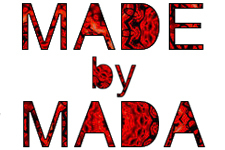 It is a sale meant to spark some interest in handmade and vintage outside the holiday season. This is usually the time of year that sales drop in many shops on Etsy and for entrepeneurs it’s a difficult time to go through. Most see it as an opportunity to work on their shops so that they’re ready for the holiday season. However, preparation doesn’t bring food to the table and that’s how this sales period was born. Today’s friday night outfit literally coloured by the theme of Christmas in July. I chose a colour that fits both the holiday season as well as the summer. The main colours in fashion for now are pastels and neon, but there is also a lot of purple shining through. For some stroke of luck I was able to find more than enough purple items to feature today. Also a very important fact about today’s post: every single shop featured is holding a sale! Please check out all these shops and read the descriptions to find out if the discount has already been applied or if you need to enter a coupon code. 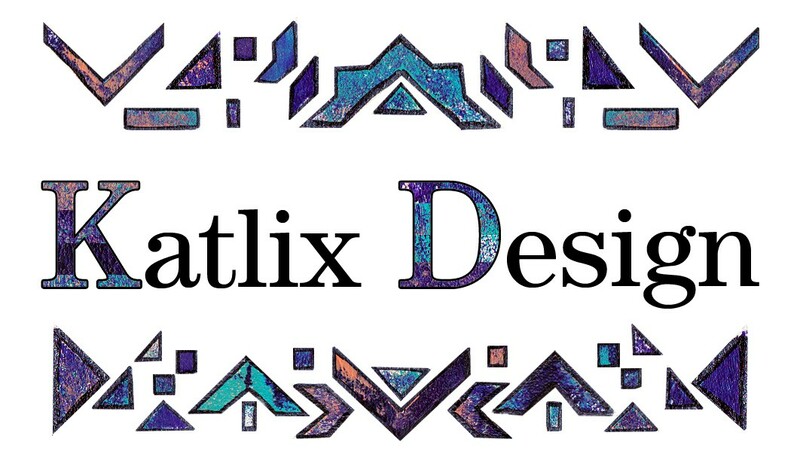 My main shop Katlix Design is also holding a sale until July 28th and everything is discounted 20%. The paisley brooch is a real eye-catcher, but the strong teal tints are wonderfully softened by a purple hue. It reminds me of lilacs and the sea. The swirly statement ring would brighten up any outfits with these bright and strong colours. Big statement rings are totally hot right now and I would definitely recommend this one. The raspberry journal looks so pretty I don’t know if I would dare write in it. But can you imagine how amazing it must look all filled up with your thoughts, memories and ideas? I am simply mezmerized by the swirly fighter fish and it’s vibrant colours. It reminds me of the fairy tale of the fish that grants wishes. Unlike the book market photograph that makes me feel all nostalgic with its softness. It is the very recognizable feeling of browsing through stacks of books for the perfect copy. I admit, I have a thing for botanical paintings, so I had no problem choosing a print to feature from this shop. The ribwort plaintain is a really beautiful wild flower and it’s captured beautifully here. The baby sandals are just ridiculously adorable! Imagine how cute they must look along with a pretty summer dress. The bohemian earrings look so very romantic, they would be perfect for an outfit for a picnic or lunch in a cafe. They look very French and sophisticated. Do I need an excuse though for wearing a gorgeous floral crown? I don’t think I do, I don’t think anyone does. This should be standard everyday wear. I chose for the soft white dress from StandardVintage to offset all those bright colours and as a clean basis for my palet. The rest of the items are all in puple hues, but not one is the same colour as the other. Nobody likes their outfits to be too mitchy-matchy, right? Also the sleeves are long which fits nicely in this fickle weather of ours. This is also why I added the deep purple scarf from Econicashop for some extra warmth just in case. Dangling from the neck is this gorgeous amethyst necklace from maggiesjewelry. A nice addition to the lace is this crocheted fiber bracelet from LikeFreja. And to truly complete the outfit I chose this very unique looking and simply fabulous round handbag from dishhandbags. So that is it for now. Like I said, all of the shops featured today are having a July sale, so it is extra worth your time to check them out. If you aching for more inspiration you can find other friday night outfits on Star of the East blog! If this looks a bit familiar you are not wrong: this is a tutorial to make a story book like this one here. The workshop during the Etsy Craft Party was a success and I was simply amazed by all the little variations in outcomes and creative uses of material provided. That’s the best part of this technique: it’s simple, but very versatile. – One big piece of paper to fold into a story book. Magazine pages work the best because they are quite thin and fold very well. Plus you are bound to find a nice colourful and interesting looking page to use. 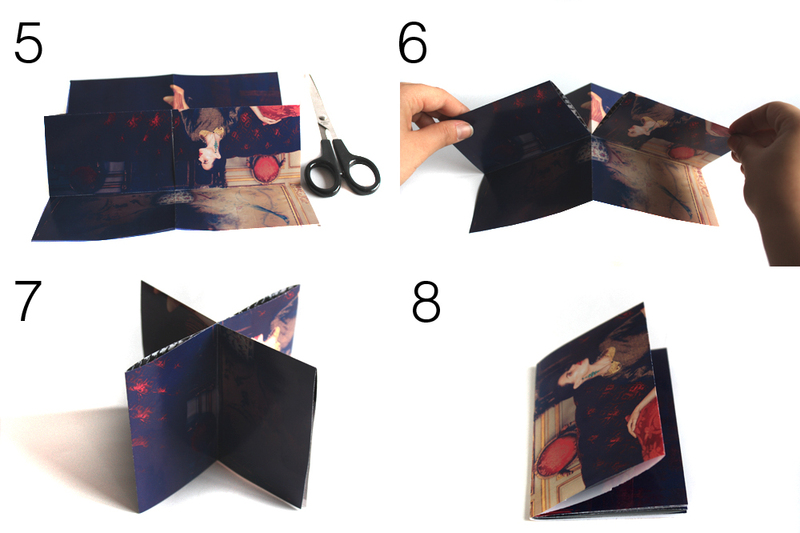 You can download a free folding guide here. – Washi tape for decoration and seal off the edges so that they look nice and straight. I simply adore washi tape and it’s become more and more common to find in ordinary shops. There’s also a brilliant selection available on Etsy. – For the story itself I use pages from old books that have fallen apart. You can also just skim a magazine to find the words you need. However, book pages do give a nice atmosphere to a story book. If you don’t have any ready you can order a packet of 20 pages with a variety of colour, typefaces and languages on Foregone Finds. 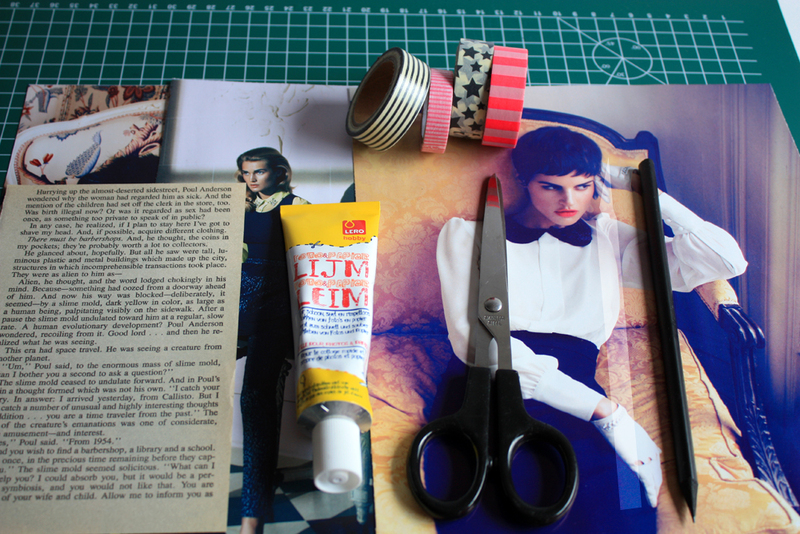 – Glue for sticking all the interesting bits and pieces into your book. – Scissors or an x-acto knife for cutting all the interesting bits and pieces out. – Optional: a pencil to press and slide over all the folding lines so that they are extra sharp and neat. – Also optional is a piece of sturdy paper to cut a nice envelope packaging from. You could also print out a nice image on sturdy matte photo stock to use if you can’t find anything else. I have uploaded a free template to use here. This envelope is for (gift) packaging only as it is too small according to post regulations! 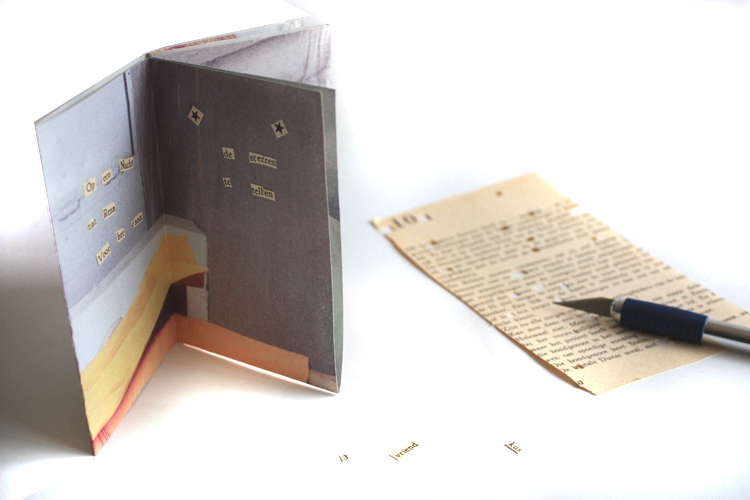 Now the most important part is picking out a nice piece of paper to fold into a booklet. Like I said, magazines are perfect for the task. Just keep in mind that you’re going to fold it into eight pages (counting both sides) and every page should have something interesting on it for your background. In the image above I’ve drawn a rough guide to keep in mind how your pages are going to look like. Once you’ve picked your paper it’s time to fold. Keep in mind that for step 1 and 2 the side you want to use needs to be visible from the outside when you fold. 1. First you fold it lengthwise. Use the pencil to press and slide over the fold to accentuate the fold. 2. Open your paper and now fold it crosswise. 3. Keep your paper closed and fold each end towards the centre to make a sort of a harmonica. 4. If you open up the paper again it should look like this. 5. 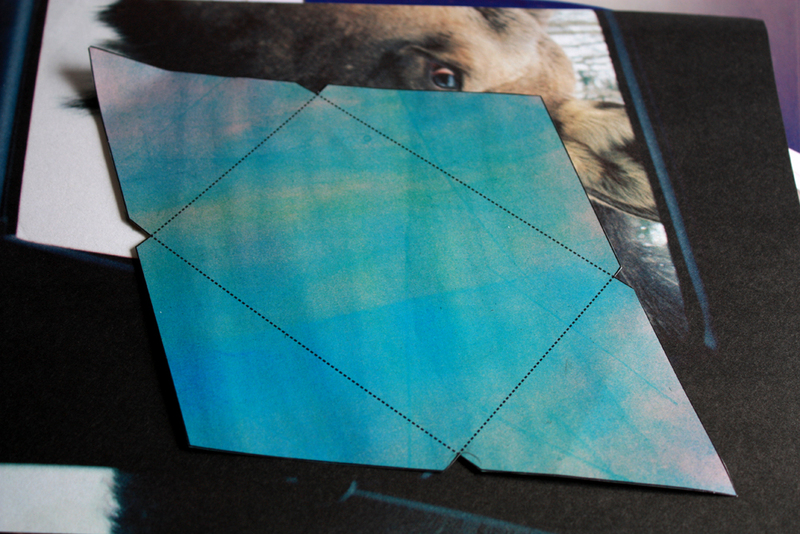 Cut alongside the first fold from step 1 until you reach the crosswise fold from step 3. 7. Until it looks like this. 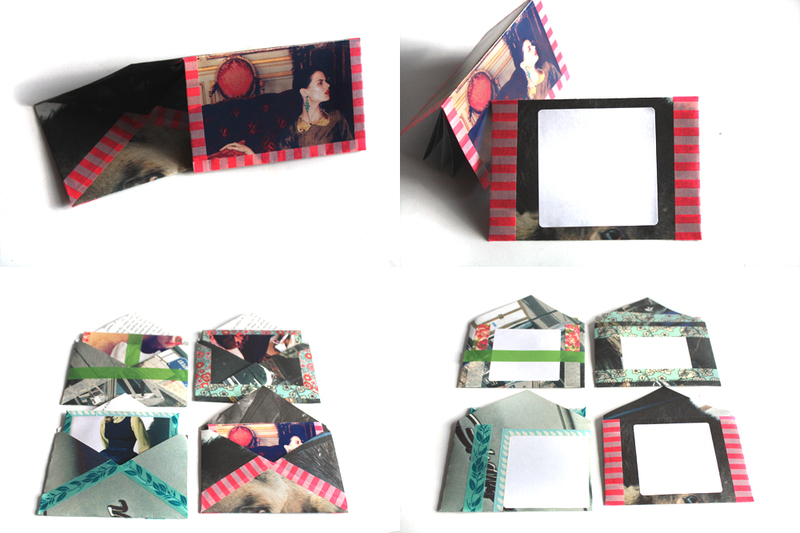 You have now basically made your own booklet and the possibilities are endless. 8. 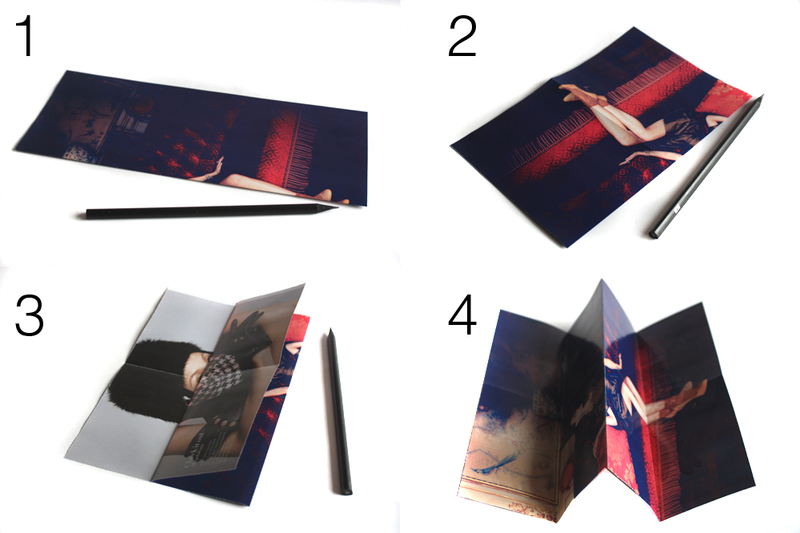 Look through your booklet to decide what the cover should be. The orientation of your story book could be both portrait or landscape, so you can weigh that into your decision. The first thing you’ll notice is that the edges won’t align. That’s okay! It’s pretty impossible for it to do so no matter how careful you are because paper always has a thickness. I go around this problem by taping up the edges with washi tape. 9. You can tape up as many edges as you want. Personally I like to mainly tape up the cover and leave the inner pages be. 10. You can use the same colour tape for your project or mix it up. If you mix it up it might be fun to carefully make a cross cut with an x-acto knife where the two tapes meet so that the transition between two tapes looks more smooth. 11. And you’re done! Once you’ve taped the edges it won’t be possible to choose a new cover, so choose wisely the first time. 12. You can now trace the envelope template over the paper you want to use for packaging and cut it out. The thicker paper will be harder to fold so you might want to go over the inside of the fold very lightly with a scissor or a bit harder with a pencil. You can use glue or washi tape to close the envelope. As you can see I’ve kept the text quite minimal. I made up a short story myself and then went on to look for the words in the book pages. You will find that it is extremely hard to find the exact words, so it might be best to look for parts of words or even individual letters. If you’re consistent in the pages you use it won’t look too much like a ransom letter! For the story book above I only used two pages. It’s best to keep it short and simple or you’ll be browsing for the right word for a week! 1. Op een nacht zat Rena voor het raam 2. de sterren te tellen. 3. Toen ze bij 70 was 4. viel er een ster uit de hemel. 5. Ze wenste om een vriend 6. en kreeg een schat. On one night Rena was sitting in front of the window counting the stars. When she reached 70 a star fell down from the heaven. She wished for a friend and received a treasure. And this is basically it! Above are some more examples and variations of how it can look. I like to stick a white square on the back to write the name of the recipient or add a small message. 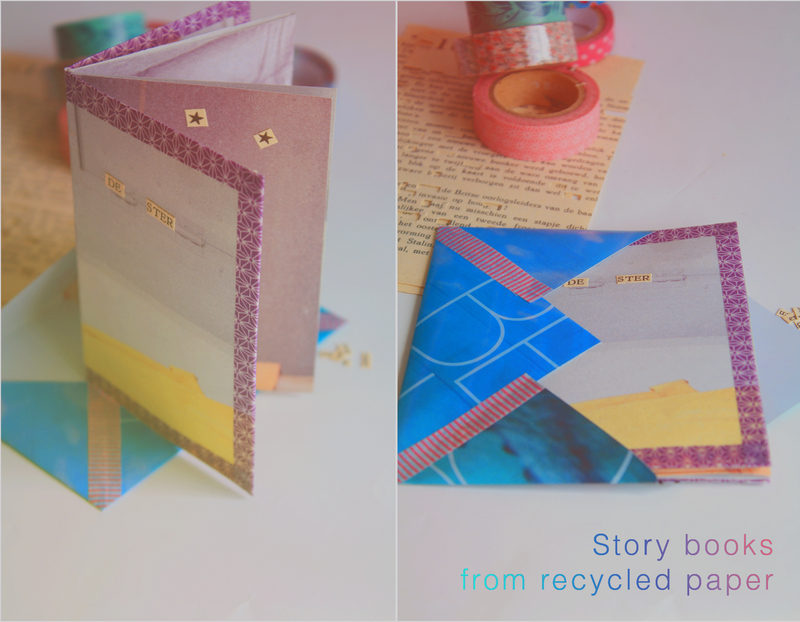 You can buy all of these booklets in a story book kit that comes with loads of recycled material to decorate them with in Foregone Finds. Each kit contains a booklet and envelope packaging, 2 book pages in English and 2 book pages in a different language, various interesting bits and pieces to decorate and a piece of matching washi tape to close the envelope. These kits are like the minimal effort for great results! If you finish your story book I would love to see the results! 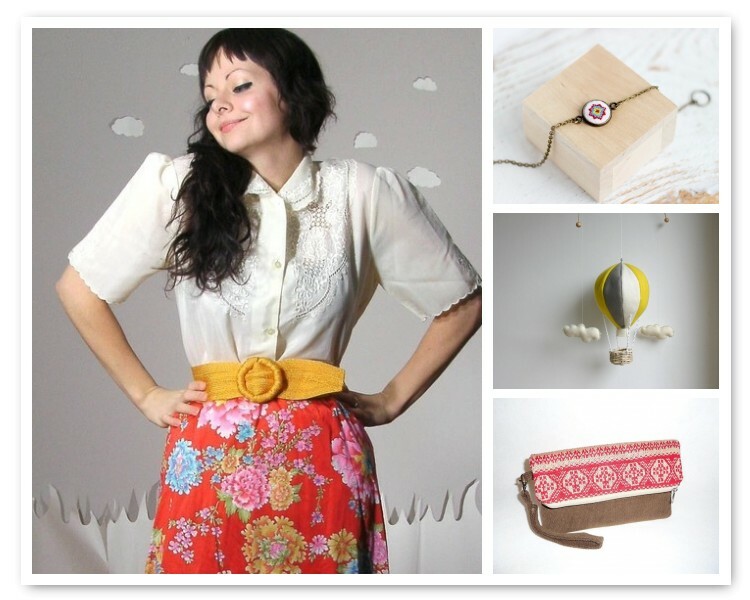 Some very exciting news this week: June 20th is the international Etsy Craft Day! All around the world people are organizing crafting parties and little get-togethers. You can search for a party in your area on Eventbrite. I am helping with the hosting of a craft party in Amsterdam and will even give a workshop myself. 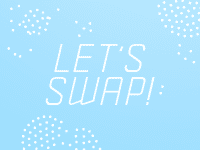 The theme of our craft party is Reuseability & Recycling. Don’t be deterred by all the Dutch, practically everyone there will speak English as well and I myself will provide instruction sheets in both English and Dutch. Ever since I have started Foregone Finds I had the aim of using and reusing as much of the old and fallen apart books as possible. I never threw anything away asides from scraps. I already started a line of original paintings that I’ve used the book pages for. However, there is still so many possibilities to recycle the text from those books. That is how I came up with my mini story books! They are ridiculously easy to make (I will post a tutorial after the craft party is over), with a minimum of supplies needed. They can be as simple as a folded paper sheet with some writing or drawing on it or as intricate as tiny scrap books. 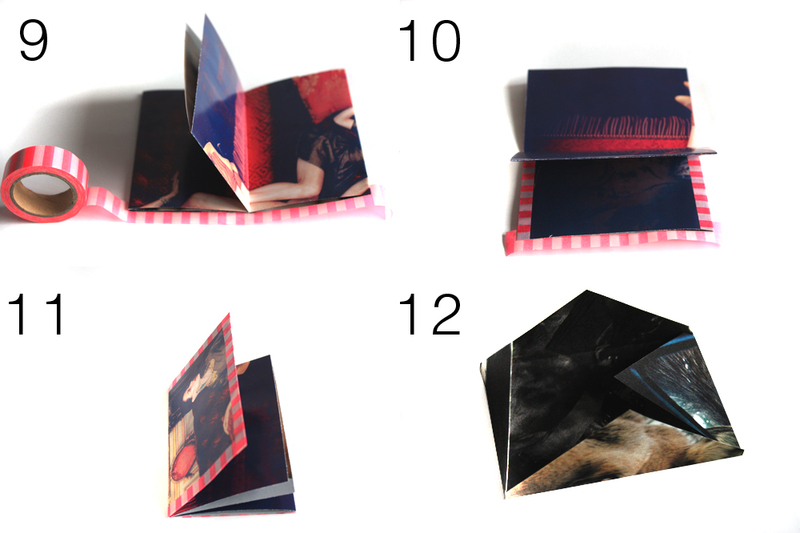 You can make a single booklet with six pages + the cover or you can bind several booklets toegether and make a longer story. They are cute, versatile and are perfect as a little snail mail treasure. The text in this particular story book is cut from left-over pages of the old books. Helping to host this craft party made me think back of all the crafting events I attended myself. I will admit, I was a bit nervous and stand-offish to go. I had no idea what to expect. But since it was in my home town I forced myself to attend and had loads of fun and met many new people. Even if the workshop itself is not quite up your alley, you’ll always learn something new and there are loads of people to have a nice chat with. Above all, crafting events are great ways to establish a sense of community and to promote creativity. Off to a BBQ today with my boyfriend’s family. So far the weather is not particularly nice, but fairly clouded and windy in fact… However my mood is sunny and bright and that is what inspired me to create this set. A bit of wishful thinking, no? The vintage party dress from Concetta’s Closet is just absolutely fantastic. I love the floral design. For the rest of the outfit I think plain black is best, nothing too flashy, or else the outfit will become way too busy for the eye. I did choose a fabulous clutch from Star Bags but in a slightly contrasting colour to complement the outfit. It’s just small addition of colour and print that is just different enough from the dress to stand out. Lucie Tales has so many great jewelry items I couldn’t resist adding two of her items. The black hair pins are so delicate that they don’t stand out to much, but add a bit of sparkle. The solaris earrings equally so, very delicate and lots of detail but are sure to catch just enough of the right attention. The sparkle comes back in the cocktail ring from Anthology27, just one big ring should be more than enough for this outfit. And finally I would finish the outfit with a black leather belt from Brooklyn Frock and leave out a necklace. 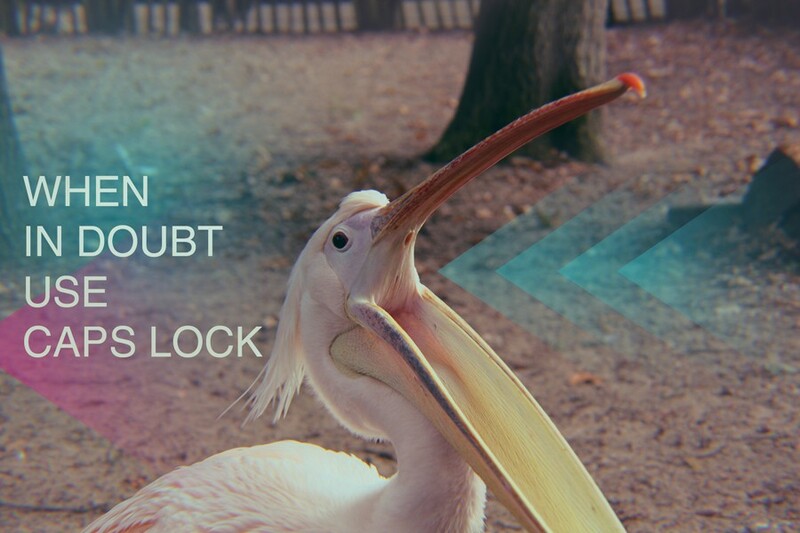 Oh well, positive thinking! Find more outfits on Star of the East blog!